Browse the web, check email, watch movies, listen to your iTunes music downloads, read your favorite ebook, play games (ie Clash of Clans, Angry Birds), or use any other of your favorite apps on Apple's iPad Air. This tablet is a great device whether you plan to use it for work or for everyday tasks like I do. When I got my iPad Air, I barely even use my regular laptop computer when I'm at home since using a tablet is way easier and just more convenient. With 16 GB (gigabytes) of storage, I don't even have to worry about having enough space for my music, home videos, ebooks, or any other downloads. What's great is that the iPad Air is thinner and lighter than the regular iPad, but still gives a better viewing experience than the iPad Mini which is considerably smaller. I must admit that Apple's iPad line is probably Steve Jobs' best creation. I actually just got one of these for my nieces as a cheaper alternative to the newer iPad Air 2 for Christmas and I didn't even have to go to one of those yuppie overpriced Apple stores anymore when Costco has the same product for cheaper. If you're still looking for something a bit cheaper then check out one of the Samsung tablets. The Galaxy 4 is not as expensive and has a larger display. Apple's iPad Air is 7.5 mm (millimeters) thin and weighs just 1 lb, so it feels unbelievably light in your hand. It comes with a 9.7-inch Retina display, the A7 chip with 64-bit architecture, ultrafast wireless, powerful apps, and up to ten hrs of battery life. And over 500,000 apps designed for iPad let you do just about anything. This comes in Space/Gray color (model MD785LL/A) but the Silver/White color (MD788LL/A) is also available for this model as well. 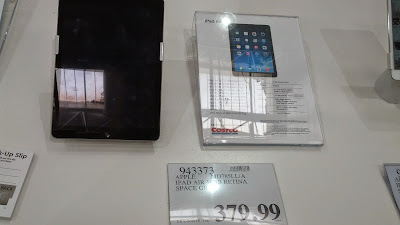 Please note that this iPad Air 2 does not have cellular connectivity. You'll need to get a different iPad in order to get cellular data.